I have to admit that when I bought this mini bundled as 3 issues for a measly five bucks from the bargain bin of a local comic shop, I had no idea the story involved Doctor Doom. 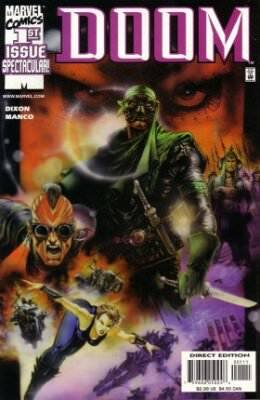 The cover of the first issue on top of the bundle looks more like a grungy post-apocalyptic story than something featuring a Marvel Universe mainstay bad guy. Well. . .what we have here IS a grungy post-apocalyptic story. But it ALSO features Doctor Doom in a way that I've never seen him before. Three issues for five bucks makes this odd little mini the definition of Longbox Junk. . .but is it GOOD Longbox Junk? Let's find out! After teaming up with The Fantastic Four to defeat a Celestial, Doom is exiled to Counter-Earth and left to die alone and weaponless. Doom sees his situation as less a death sentence and more an opportunity to conquer a new world. . . This issue took me a bit by surprise in presenting a Dr. Doom I hadn't ever seen before. . .one without super-science weapons and armor, making his way through a brutal world by his will alone. Chuck Dixon does a great job with Doom's constant inner monologue, where he simply convinces himself that he is right where he wants to be and that all will fall in place. It's so gleefully self-important and so overly-self confident that I can tell that Dixon had a lot of fun writing this story. Unfortunately, the story somewhat hinges on reader knowledge of (then) current Fantastic Four continuity. There's a bit of exposition, but not much. I guess this mini is supposed to fill a plot hole around Fantastic Four #25 (in the then-current series). That said. . .I still really enjoyed this story without the Fantastic Four connection. 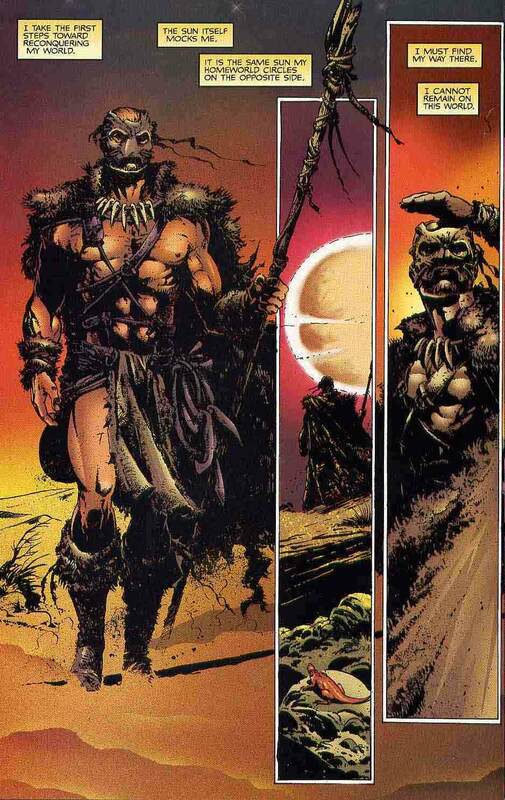 Just seeing Doom wandering a post-apocalyptic landscape dressed like Conan the Barbarian and being a general badass was enough for me here. There's also a side story involving Doom's minions bunkered down in the fortress-like Baxter Building in the ruined version of counter-Earth's New York City that is good, but a little meaningless without knowing the context of this story in the ongoing Fantastic Four continuity of the time. The art in this issue is a real standout. The dark and moody style really helps to sell this strange Doctor Doom as Mad Max story in a big way. 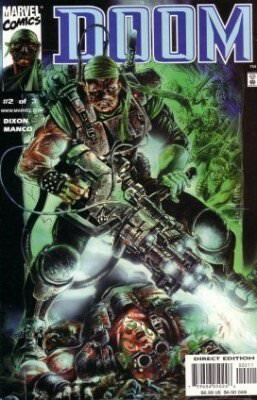 I'm not that familiar with Manco's art beyond some painted covers that had a definite Boris Vallejo look to them. . .here, his pencils and inks look less like fantasy poster art and much more like a less exaggerated Simon Bisley. NOT your usual Doctor Doom. . . Overall, this first issue knocks it out of the park with both story and art. I don't like that it hangs on a Fantastic Four continuity hook, but other than that, it's a winner! After orchestrating a slave revolt, Doom escapes captivity and continues his journey to New York City, where his followers desperately defend the Baxter Building from Atlan attackers. This series continues to be strong with this second issue. It's mostly action as the two story threads begin to move together. . .Doom escaping captivity by way of a bloody slave revolt and his followers defending the Baxter Building from the attack of a gigantic beast unleashed by their Atlan enemies. 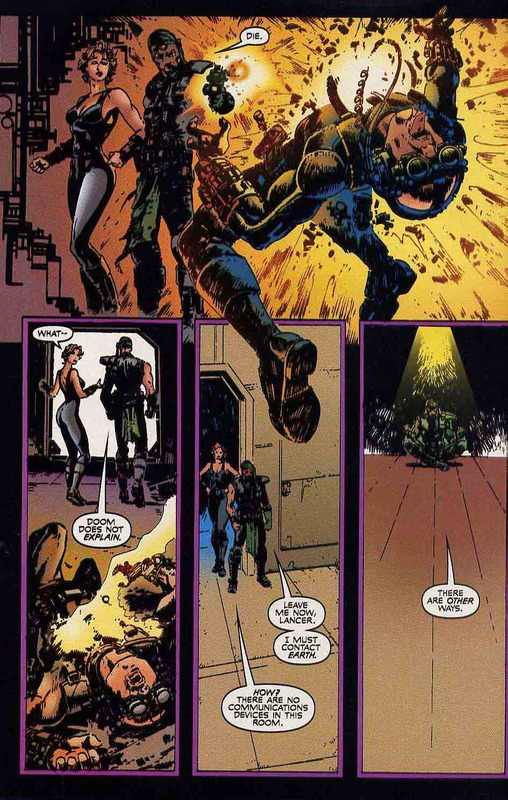 Of the two stories, Doom's was more engaging, once again because of Dixon's unintentionally(?) hilarious inner monologue of Doom's complete self confidence and utter knowledge that because Doom is on this world. . .everything on the world belongs to Doom. The story taking place in New York isn't BAD, it's just that I don't really have much of an idea of who the people involved are or why they are there in the Baxter Building defending it against attacks from Atlantis. Once again, the dark and gritty art really helps to sell this story in a big way. Manco's style is very intense and expressive without distorting reality to get that effect. page composition and shadows are built perfectly. It's a very cinematic style that I like a lot. Overall, this second issue keeps things moving at a fast pace toward the conclusion, with continued strong effort from both the writer and artist. 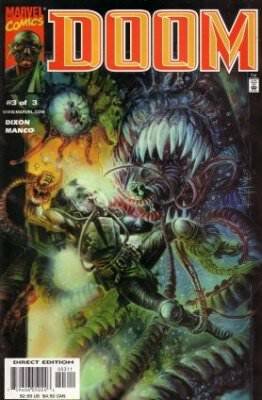 Doom arrives in New York in time to turn the tide of battle in favor of his followers defending the Baxter Building against an Atlan attack. Following his victory, Doom activates a portal and returns to Earth, vowing to destroy the Fantastic Four. And so we come to the big finish. . . It's pretty much all action as Doom battles his way to the Baxter Building, but Dixon's internal monologue keeps the thin story from getting threadbare as Doom faces down even the most powerful attacker with the supreme confidence of a true megalomaniac. The ending of the story is pretty much consumed with connecting this mini with (then) current Fantastic Four continuity. . .tying things in with Issue #30 of the (then) ongoing series, so it seems a bit meaningless as far as THIS series is concerned. Sure, it wraps things up, but it's really more of a "to be continued" than a "the end". Overall, despite a bit of a bumpy landing, this final issue was still a good read, with great moments from both the writer and artist along the way. "Doom does not explain." Best line in the series! After my extreme disappointment with the ending of Terminator: Enemy of My Enemy, I was very pleased and pleasantly surprised to find myself coming across a REALLY good piece of Longbox Junk in this short mini. It presents a fairly overused character in a different setting than I'm used to seeing him in. The writer gives us an inner monologue that I can tell he had a lot of fun writing. It's so over the top that it's borderline great. The dark and gritty art perfectly sells the strange story of "Mad Max Doctor Doom". The creative team really hit it out of the park on this one. That said. . .other than the continuity ties, this mini was a delight to read and a fine piece of Longbox Junk. And I'm sure that my saying that is exactly as Doom wishes it to be! Back to the very beginning of one of Dark Horse's most successful franchises. . .
Aliens Vs. Predator 4 issue mini.